Occupational Safety & Health Administration (OSHA) standards for first aid kits. Bulk discount!!! Buy 4 - osha first aid kits at only $23.95 each. Bulk discount!!! Buy 3 - 25 person osha first aid kits at only $25.50 each. Bulk discount!!! Buy 3 - 50 person osha first aid kit at only $49.99 each. Bulk discount!!! Buy 3 - 50 person osha first aid kit at only $38.89 each. Bulk discount!!! Buy 3 - 10 person osha first aid kit at only $14.39 each. Bulk discount!!! Buy 3 - 10 person osha first aid kit at $13.77 each. Bulk discount!!! Buy 3 - 25 person osha first aid kit at $17.59 each. Bulk discount!!! 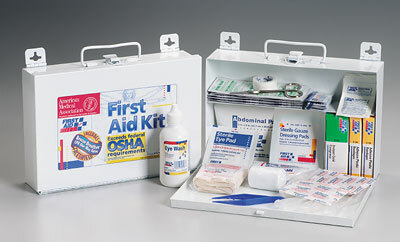 Buy 3 - 25 person osha first aid kit at $15.50 each. 50 Adhesive Bandages - 3/8" x 1 1/2"
50 Adhesive Bandages - 3" x 3/4"
20 Adhesive Bandages - 1"x3"
18 Wound Closure Strips 1/4"x1 1/2"
2 Gauze Rolls - 2"x4.1 yds. 10 Sterile Gauze Pads - 2"x2"
4 Sterile Gauze Pads - 4"x4"
1 Sterile Trauma Pad - 5"x9"
1 Adhesive Tape Roll - 1"x5 yds. Bulk Discount, purchase 3 at only $44.95 each! This 106-piece first aid kit is ideal for contractors, fleet vehicles, work sites or small companies with up to 25 employees. It meets federal OSHA recommendations and carries 17 critical products including a 4 oz. eye wash. The strong metal case is wall mountable yet has a handle for easy carrying. · (1) Eye wash, 4 oz. 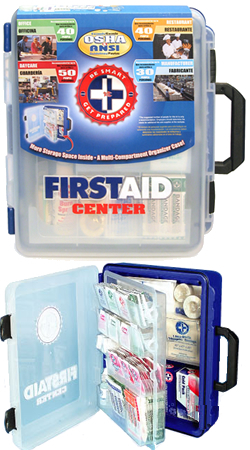 This 107-piece first aid kit is ideal for contractors, fleet vehicles, work sites or small companies with up to 25 employees. It meets federal OSHA recommendations and carries 17 critical products including a 4 oz. eye wash and a Rescue Breather CPR one-way valve faceshield. The strong metal case is wall mountable yet has a handle for easy carrying. This well-equipped, 104-piece kit is ideal for fleet vehicles, vans and small offices. 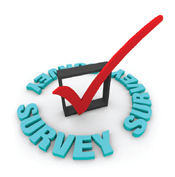 It meets and exceeds OSHA recommendations for 5 people at the work site or up to 10 people at the office. Intuitive design offers instant access to first aid products in emergencies. High quality supplies are housed in a sturdy, partitioned, water-resistant plastic case, which is easily carried or mounted on wall or vehicle. This 194-piece first aid kit is ideal for contractors, fleet vehicles, work sites or small companies with up to 50 employees. It meets federal OSHA recommendations and carries 20 critical products including a 4 oz. eye wash and 6-piece CPR kit. The rugged metal case is wall mountable yet has a handle for easy carrying. This 194-piece first aid kit is ideal for contractors, fleet vehicles, work sites or small companies with up to 50 employees. It meets federal OSHA recommendations and carries 20 critical products including a 4 oz. eye wash and 6-piece CPR pack. The partitioned, water-resistant plastic case is wall mountable yet has a handle for easy carrying. 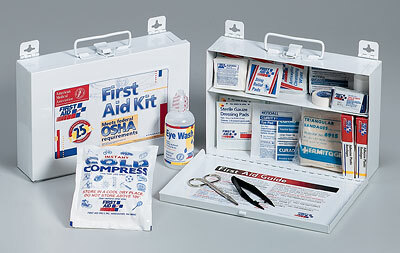 This 62-piece first aid kit is ideal for contractors, vehicles or small companies with less than 10 employees. It exceeds federal OSHA requirements 1910.151b. (State requirements may vary.) Sturdy and convenient, the 10-unit plastic case contains the first aid essentials to prepare you for work-related accidents. The partitioned, water-resistant plastic case is wall mountable yet has a handle for easy carrying. This 106-piece first aid kit is ideal for contractors, fleet vehicles, work sites or small companies with up to 25 employees. It meets federal OSHA recommendations and carries 17 critical products including a 4 oz. eye wash. The partitioned, water-resistant plastic case is wall mountable yet has a handle for easy carrying. This refill was designed to replenish the key items for the 195 piece, 50 person bulk first aid kit.